A monthly guide to Antiques & Collectibles since 1975. Yesteryear tells you where to find them! Each monthly issue is packed with information YOU can use! Extensive Calendar of Events lists antique shows, flea markets and more for Wisconsin and surrounding states. Regional Antique Shop Directory is updated monthly. Knowledgeable national columnists, including popular question-and-answer formats, are featured in each issue. 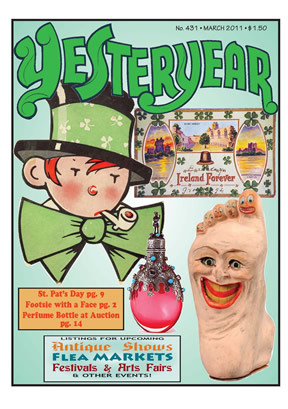 Be sure to look for the latest issue of Yesteryear at your favorite antique shop, or just click on the subscribe link to receive your own copy each month!